Before Theresa May became Home Secretary in 2010 there had been five others in six years. That she lasted 6 years goes to show that she is a survivor. What has sunk others was a stepping stone for her to the top job. The media was broadly supportive, and the general public seemed to think that she did well, or well enough. When Home Secretary she cut police numbers by 20,000. She was vilified by the Police Federation. She said that they were “crying wolf” over the cuts. However, while she cut the police numbers crime fell. Obviously, TM was right. Except, the crime reduction was in line with a drop in recorded crime internationally. Also, the spread of CCTV and more secure vehicles would have helped. The recent meteoric rise in knife crime has not persuaded her that she was wrong to push the cuts through. Only within the last couple of weeks she said There was “no direct correlation between certain crimes and police numbers”, and. “What matters is how we ensure that police are responding to these criminal acts when they take place, that people are brought to justice.” This obviously true (as someone said cutting the number of police on the street would have no effect on financial fraud), but it does have a direct impact on street crime. The present Home Secretary disagreed with her, he said that the police must be given the resources to tackle violence. It is not just the bobbies on the beat that have been sacked. Out of about 7,000 armed officers in 2010 almost 1,500 had gone by 2016. As most of the remaining armed officers are in metropolitan areas there were real fears that those of us outside of London would have no protection in case of terrorism. She promised to employ another 1,500 in 2015, so that is alright then. It would have been so much better if they had not been sacked in the first place! Talking about terrorism, what was the point of the Tpims (Terrorism Prevention and Investigation Measures)? No body uses them. That should make us all feel safe in our beds. Also, she had a huge row with Michael Gove when he was Education Secretary. He wanted the “drain the swamp” of Islamic extremists, her approach was more conciliatory (which I agreed with). Later she reneged on that position saying that there had been “too much tolerance of extremism”. So, she was saying that she was wrong and Gove was right!! Theresa May’s approach to immigration and refugees was to talk tough and when the going got tough to hide. One of her Immigration Acts was supposed to “create a hostile environment” for illegal migrants. It included landlords checking on tenants’ status, among other things. Remember the Go Home vans touring “immigrant” areas? The whole expensive, repugnant exercise resulted in just 11 people leaving the country. As for dodging the brickbats. When the immigration figures came out and the government’s targets were missed, did she front up? Of course not, she sent poor James Brokenshire to face the press and Commons. When she failed to tackle rising immigration effectively it was not her fault, she blamed the rest of the government. When they wanted her to remove the overseas students from the target I (a classic Thatcher tactic to make employment figures look better) Theresa May refused! On the other hand she did keep deporting people who did not earn enough, which split up an estimated 33,000 families. She also refused to limit the time anyone was held in detention centres. She pushed through elected police and crime commissioners. That worked so well, catching the imagination of the whole nation. Can you remember who your commissioner is, and di you vote in the election? Oh yes, the last thing that she did as Home Secretary was to ensure that any inquiry into the Battle of Orgreave would not take place for years and years. Somebody has to protect Thatcher’s memory, too many skeletons in that cupboard, obviously. But to answer my question in the title, what is she good for? Absolutely nothing (to quote Frankie)….. I have been playing with copper pipe for a few weeks. I thought that using copper pipe was an unique and interesting idea. Turns out that while it is interesting it is hardly unique. The reason I started with copper pipe is that I ran out of interesting and useable wood for turning. My first attempts produced a few candle sticks. They were quite successful and were well received by friends. I enjoyed making them, they were fine and it was good to use a different medium. Yes, I know, the colour of the candles are wrong for copper pipe but they were all that I had……..
Copper Tom is a figure I made. He is siting, thinking. I like to think that Copper Tom is a thoughtful sort of chap. He also skiis (although I do not have any photos ) I plan to have him fishing but have not gotten round to it just yet. Today I used copper pipe to make a lamp. Although you can not tell from the picture it has an Edison type old fashioned bulb and stands about 18″ tall. I think that it is quite neat but the bext one willbe better! Photos of these and future copper items will appear in the “Here are some things that I made earlier” page which is found under the main Woodturning page. It is 6 months, to the day (13 June 2018) since my stroke. There are a couple of niggling outcomes from my stroke, like not being able to drink a cup of coffee without there being a small drip down the side of the cup. (My mouth does not form a complete seal). On the other hand the day after my stroke I could not even swallow coffee without choking, so it is all relative. Of more concern are my eyesight and the feeling in my right leg and foot. If you want you can read the full story starting here. My stroke left me with double vision. 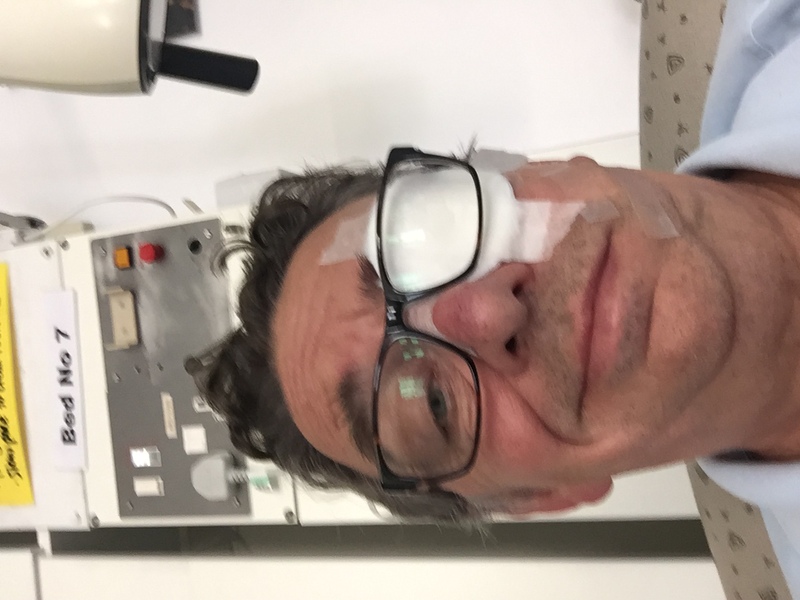 As everything else improved after my stroke I hoped that my eyesight would as well. There has been some improvement but I still have double vision that is corrected by a special, temporary, prism that is added to one of the lenses in my glasses. For day to day life this is fine but whenever I take my glasses off the double vision returns. Swimming on holiday was difficult, so is getting out of bed in the morning before I find my glasses! There may a resolution to the double vision problem. 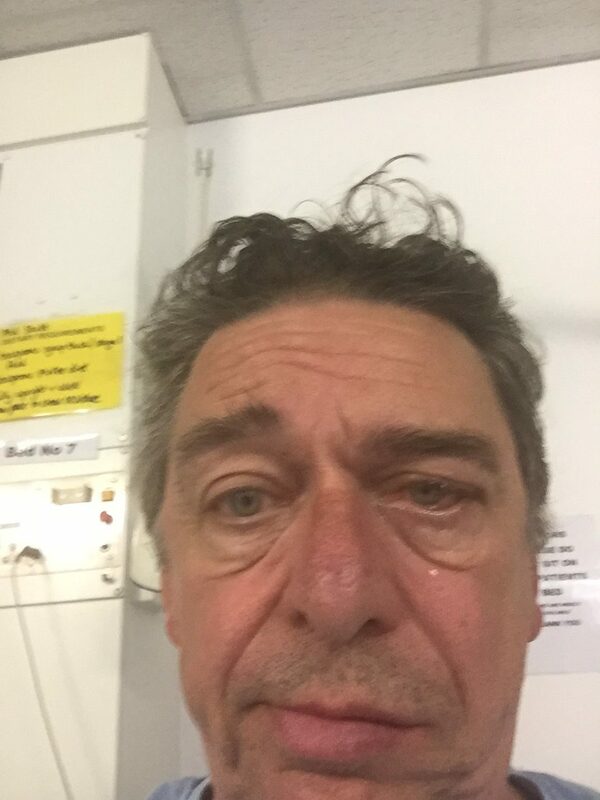 I am due to see the consultant on 14th December. I hope that he will agree that an operation is possible. The operation involves tightening muscles at the back of my left eye to correct the vision. I talked to a doctor about it a couple of months ago. He said that the good thing was that they can ask you if the vision is fixed and if not tighten or loosen the muscle as required. When I asked what he meant he said, ”well, obviously, you will be awake while they do the operation”. WHAT!? As if having a stroke was not bad enough, they are going to be fiddling with my eye, with scalpels and things, while I watch? Bloody Hell! A couple of days after my stroke the doctor took me to a wash basin and put my left hand under the running cold tap. Then my right hand under the same cold water. That was not all, while I could feel pressure in the whole of my right side from the neck down I could not feel pain. I could stick a pin in my shoulder or pinch myself, and all I could feel was a vague feeling. I would know that something was pushing against my skin but that is all. Over the next few weeks the numbness retreated until it was only my right leg and foot that was numb although the difference in heat perception remained. Imagine being under a shower and half of you feeling scolding hot and half of you icy. It does make showering interesting, especially if you test the temperature of the shower with the wrong hand, the cold hand. You step into a shower that is hot enough to take your skin off! THis effect is typical of a lateral medullary stroke. It seemed to please the doctors no end as they kept bringing their friends to stick pins in me and put my hand into cold water. Apparently this type of stroke is quite rare and they all wanted a go at pin sticking! The numbness has gone but it has been replaced by overactive nerve endings in my foot and ankle. This means that whenever I put socks on or shoes all the nerve endings in my foot all start shouting at the same time. Not exactly painful but nearly. Stepping on uneven ground in thin soled shoes is like some form of non marking torture! As for going on to the sea on holiday! I went on holiday a month or so after my stroke. Going into the water was very difficult. The hot sand was refreshingly cool (if I hopped on my right foot). The water was nicely warm, for one leg. Then all the nerve ends in my right foot and leg decided to announce that they were surrounded in water, all at the same time and continuously. The first time it happened I fell over! I have no idea what the other people on the beach thought. I was wearing an eye patch and falling over in the water while trying to hop on the sand. No wonder I was given some odd looks! I am pleased with how things have gone after my stroke, It could have been so much worse, and is for most people who have a stroke. I am not belittling the issues and problems that some people experience after a stroke. They can be life affecting and limiting. I realise just how lucky I have been. I am only marginally incompasitated and still feel that glad to be alive feeling every morning. 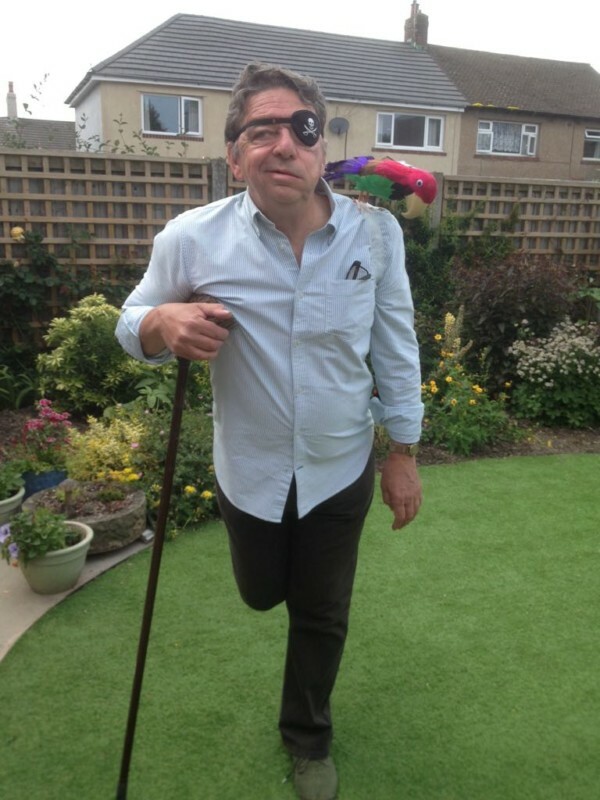 10 days after my stroke I went to a birthday party, eye patch, parrot and all..
How to cope with a loved one who has has a stroke. The last few years have not been the best for me as far as my health has been concerned. In 2016 I was diagnosed with depression. It became clear that I had been depressed for a number of years. The diagnosis came after an operation that caused me some nasty moments. I had been feeling better at the start of this year and was in the process of reducing my medication with a view of stopping it all together. Then I suffered from a stroke (The story starts here). All in all not a good couple of years. While I have been supported by most people through my depression, totally by friends and family to whom I owe more than I can repay, the same can not be said of all of my colleagues at work. One of the problems with depression is that it is not visible and is easy to forget , or overlook. Most people at work have shown an understanding that is wonderful. Some have asked me how I was feeling at regular intervals, and asked in a way that showed that they did actually want to know. Some shared that they have family members that were also sufferers of depression. There have been others, though who have not been supportive. Some people have called me miserable and bad tempered to each other, but not to my face. I have tried to ignore the comments. Such attitudes were the ones that I expected when I decided to be open about my mental health problems. Their attitudes remain hurtful though. I do have one message for those people and that is people with depression are down and sensitive a lot of the time. That is part and parcel of being depressed. The answer is not for someone to tell the person suffering to “man up” or for them to judge them for being withdrawn. I reached the normal retirement age last year (I know, you would not think so to look at me. I get that a lot – in my dreams) but I decided to carry on. One of the main reasons was that I did not think that I could cope without the structure of having to get up to go to work in my life. Being at home, with nothing to do with depression is not a good recipe. I was feeling better early this year, the depression was lifting and I was coming off the Sertraline. I decided to retire at the end of this year, telling my boss and a couple of friends at work. The aftermath of stroke became a sort of dry run at being retired! I had 10 weeks at home (I should have taken longer) in which I managed to organise a structure for myself. It was centred on walking into town every day and down to the river most days. As discussed previously the purpose was to get rid of my walking stick (ditch the stick!) and to get to the stage where I was able to walk in a straight line, and not fall over. The down side of having a stroke (one of the many) is that depression is a common result. So it was for me. The anxiety, panic attacks and feeling of inadequacy all came rushing back. Despite that I decided to stick to my retirement plans. The problem of structure does not seem insurmountable anymore. My retirement structure may not be centred on walking, but that will be part of it. I expect that wood turning will be the main part of my structure, perhaps I really will learn to play the guitar – this time. One thing is certain, the stroke did not win, neither will depression. Roll on the 19th of December, my last working day!! Information about emotional changes brought on by a stroke. Information about coping with Depression. Trump and his administration seem to cause chaos where ever its shadow reaches. That, of course, could just be a reflection of how I feel about this embattled president. However, just how is it possible for even Trump to cause confusion about the future of the census? The census first census was in the late 18th century and it has been held every 10 years from 1902. You would have thought that, by now, it would almost run itself. Individuals change, people are born and they die, but the process is the same, surely? One of the problems this time around is the fall out of the trump administration’s culling of people thought to be “not one of us” when they took over. There is no permanent director at the bureaux. John Thompson jumped ship in early 2017. More than a year later Trump’s nominee has not yet been confirmed. The deputy director was to be Thomas Brunell. But Trump’s choice withdrew after his lack of experience and his views on legislative redistricting were criticised. (UK readers think Gerrymandering, or Dame Shirley Porter – you get the idea). So, no permanent leader or deputy, what else could be going wrong? Someone has decided that, in this digital age, that the census should be computerised. That is bound to be a good idea, quicker, probably cheaper and no pieces of paper to get lost. In any other country than one that still has to use paper ballots in some of its elections because of the lack of connectivity it would be a great idea. The USA has a situation where 30% of Latinos, African- Americans and some rural areas do not have a broadband connection. (more details HERE) It is also hard to persuade them to go to a centre to register their details. Even harder to persuade anybody that their details will be safe from hackers. Apparently Congress does not care about these issues. They even cancelled 2 of the 3 full field tests. Really, what could go wrong? This is a new question for the census. It asks “Is this person a citizen of the United States?” There are obvious implications. If someone is not a citizen would they want to tell the authorities that when they know Trump’s opinions? Trump could shout from the roof tops that the information is blind, but who would believe him? The trouble is that if the Trump administration asks a question that they suspect people will refuse to answer and so not complete the census then the census becomes something else. According to the constitution of the USA the census is an “actual enumeration” not a sample, not a guestimate, not a survey it is meant to be a full attempt to count as many of the country’s residents as possible. According to the New York Times; “Authorizing the first census in 1790, Congress mandated a count of “inhabitants.” Boundaries were porous, and the country was founded on the principle that anyone could move here. “The bosom of America is open to receive not only the opulent and respectable stranger, but the oppressed and persecuted of all nations and religions,” George Washington wrote in an open letter to recent arrivals from Ireland in 1783. Newcomers haven’t always been made to feel welcome since then, but the census has continued to reflect the recognition that they are here.” Until now. The Tories are telling lies about the funding increase to the National Health Service. 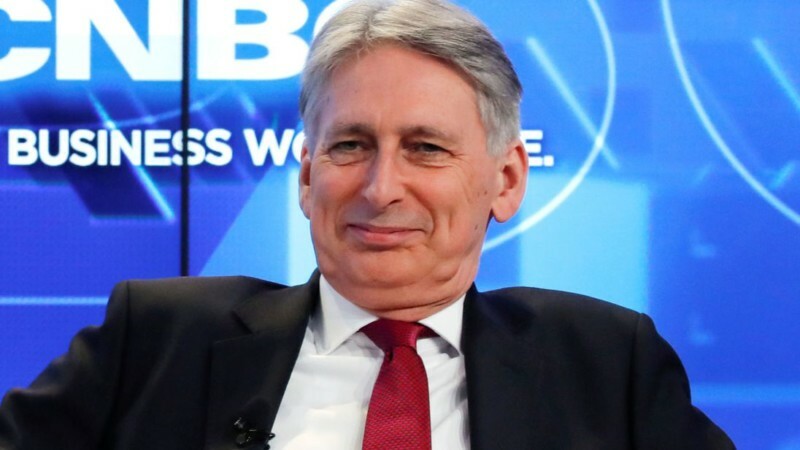 Philip Hammond is again playing fast and loose with the truth. Double counting, or quadruple counting in this case, is not normal practice for a government, or anyone else. The health budget for NHS England (other parts of the NHS are funded separately) is about £110 billion so an increase of £84 billion seems really impressive. But, the truth is much less impressive. Through inflation the NHS spending will rise to £135 billion by 2023/24, that is £20.5 billion and that was announced by the government before the budget. It is also where we start looking for this mistical £84 billion. Lies, Damned Lies, Statistics and Damned Tory Statistics. The origin of the £84 billion “increase” in NHS funding is convoluted to say the least. Each year the money spent on health goes up by an estimated inflation figure of between 3.1% and 3.6%. Add each year’s increase together, throw in the inflation increases for the Northern Ireland, Scotland and Wales plus a £1.25 billion a year for National Health Service pension contributions and there you have it £84 billiuon. “We’ve announced an unprecedented £84 billion real-terms funding boost for the NHS, what the NHS says it needs”. Do you remember another time Philip Hammond made a rather outlandish claim? Not about National Health Service Funding this time this is the time he claimed that unemployed people are a figment of our imagination! Would a privatised National Health Service work? See this post for my view. Don’t just take my word for it read this from fullfact.org. Police Funding has fallen since 2010/2011. It is heartening that Nigel Evans, the local MP, has just realised that the police need more funding. It is a shame that he has been voting for reductions since 2010, and yet does not accept that police funding has fallen. In fact, the funding from central government fell by 30% during the period 2010/2011to 2017/2018. By increasing funding from local sources (i.e. Cuncil Tax) the average overall fall in funding has been 19%. However, the central funding is going to increase this year, isn’t it? Well, There was an announcement that police funding was to increase by £460m in 2018/2019. (The whole police budget is about £12.3b so it is hardly an earth shattering increase in police funding). But even with this increase the central grant is going to be the same as 2017. As inflation is running at 2% that means a real terms cut. £280m is going to be raised by allowing the police to raise the amount they can raise through the council tax. £50m is being spent on antiterrorism and the other £130m has been set aside for special grants to meet unexpected costs for events such as terrorist incidents, and for improving the technology used by police forces. In summary, the Tories have cut the funding from central government by 30% in 8 years. Even when austerity is dead and police funding is going to increase it is not being increased from central government coffers. Most of the small increase will be from council taxes. And the rest is made up of money for counterterrorism. So, valuable money to fight terrorists but not for more bobbies on the beat. Nigel and his Tory mates are trying to distance themselves from the result of their own policies and beliefs. They are either in denial that they have reduced police funding, or they are just cynical and think that we are all fools. For the record, police funding increased by 31% between 2000/01 and 2010/2011…. My stroke was on 13th June 2018. My new life started on the 14th. I did not sleep well on male stroke ward B2 in Blackburn Royal Infirmary that first night. There were a lot of thoughts going round and round in my head, of course. Then there was the noise, the groans and the ramblings. It was a small, modern, ward and there were 5 other stroke patients. The nurses did not stop attending to first one and then another patient. As I lay there it was obvious that they were in a lot worse state than I was. Perhaps Lauren was correct; perhaps I did have the “good” type of stroke. As the following morning dawned I realised a couple of things. Firstly, I still had double vision. Second, I had been incredibly lucky. The first treatment for a stroke as a result of a clot (an ischaemic stroke) is to give the patient a blood thinning drug. The treatment is called thrombolysis. It thins the blood and so “dissolves” the clot. It is very effective if given within 4 hours of the onset of the stroke. After thrombolysis, 10% more patients survive a stroke and live independently. Despite its benefits, there is a risk that thrombolysis can cause bleeding in the brain. This happens to about one in 25 people within seven days of thrombolysis, and this can be fatal in about one in 40 cases. The sooner someone is treated, the better their chances of improvement, and the lower the risk of harm. The risk of a bleed in the brain is the reason that I was not allowed out of bed for 24 hours of the treatment. I would be unsteady on my feet after the stroke and could easily fall over. Knocking my head would mean that there would probably be a bleed in my brain, and I would die. With that sort of reasoning I was happy to spend 24 hours in bed using a bottle. Well, not happy, but using a bottle was preferable to dying. When I was in the A&E I had said to Carol that I would be back to work in a couple of days. At that time I had no real appreciation of just how ill I was. One thing I did know was that this bloody stroke was not going to beat me. I would get better, I would return to work, and I would put this inconvenience behind me. I must say that the early days after my stroke were some of the most life affirming of my life. Every day, every morning and afternoon seemed to be marked with an improvement, (apart from the double vision). My left eye would not close. My face had dropped on the left. My speech was badly affected. I was unsure whether my cognitive abilities had been affected. Apart from that I was OK.
None of these symptoms are unusual for stoke victims. It could have been a lot worse. Objectively I could see that I was in a far better place than most of my neighbours, either physically or I was more positive. The double vision was the worst thing. It meant that I could not read, or see what was going on around me clearly. The solution to that was to tape my left eye shut. I was given a gel to put in my eye to moisten it to keep it from drying out and being scratched. With the left eye shut I was able to see clearly. I could read, type messages, and recognise who was talking to me! The solution to my eye not closing did present me with another issue. Taking the tape off my eye resulted in a loss of eyelashes and eyebrows! Still, that they would grow back was reassuring. Gradually, my eye did begin the close. I can remember the first time I was able to wink at someone after my stroke and how good I felt being able to do something so simple. It took me about a month before my eye would close. Even before the Occupational Health team descended on me I decided that I would need to do something about the fallen side of my face. In my mind the best thing that I could do was to rub my face to stimulate it and to remind my brain that it should be controlling that side of my face. As it happens that is one of the exercises recommended to stroke victims so I got a head start. Improvements began within a few days. Swallowing and speech impediment were connected. Half of my mouth and throat did not work. The day after my stroke I called Paul, my manager, to say that I was still alive. I also wanted to tell him that there were a couple of bananas in my desk and that he should remove them before they went off. The trouble was that I could not make the explosive “b” sound. It took hours – well, it seemed like hours – until I could make Paul understand what I was saying! All explosive sounds were impossible. The best way to improve the situation was to practice talking, so I did, I talked to anyone who would listen. The swallowing function is something that often suffers after a stroke. For me it left me unable to swallow. The best I could do was to use my tongue to shovel the food or drink to the right of my mouth and, with my head tilted, swallow. The problem with being unable to swallow as you have done for all your life is that it is easy to forget that you need to be careful. Food or drink in your windpipe causes coughing but the real concern is that swallowing problems can lead to chest infections and pneumonia. I was put on food with the consistency of baby food to reduce the danger of infection . Even worse, even the water and coffee had to be thickened to the consistency of sloppy wallpaper paste! I practiced swallowing the gloopified water and gradually my swallowing improved. I was on unthickened water and thicker baby food within 2 days. As soon as I got home I moved on to “real” food! I will tell you more about the remaining issues and how they affected me (and still do in some instances. Yes, it is meant to be a smile, day 3.